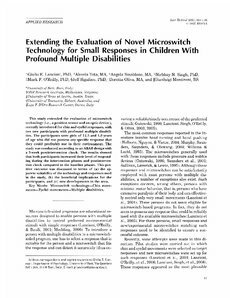 This study extended the evaluation of microswitch technology (i.e., a position sensor and an optic device), recently introduced for chin and eyelid responses, with two new participants with profound multiple disabilities. The participants were girls of 12.5 and 4.0 years of age who did not possess any specific response that they could profitably use in their environment. The study was conducted according to an ABAB design with a 3-week post-intervention check. The results showed that both participants increased their level of responding during the intervention phases and post-intervention check compared to the baseline phases. This positive outcome was discussed in terms of (a) the apparent suitability of the technology and responses used in the study, (b) the beneficial implications for the participants, and (c) new developments in the area.